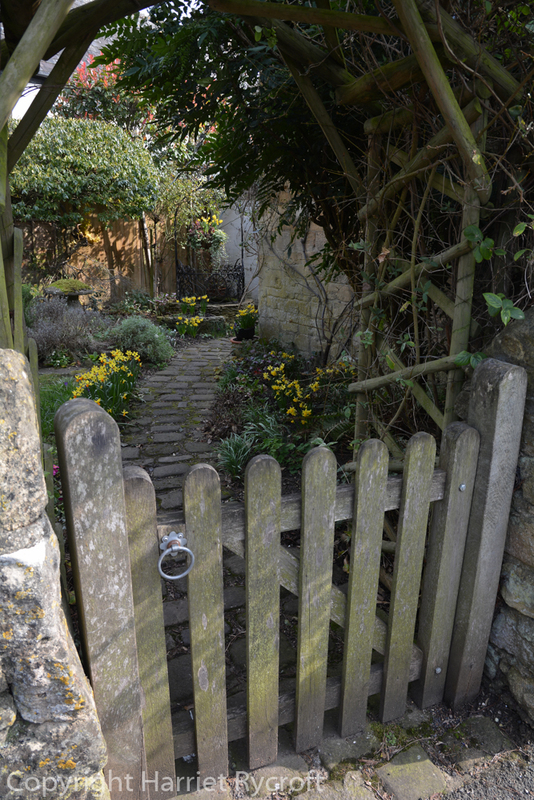 I live in the shadow of the Cotswolds, and much as I’d love to have a dinky little Cotswold stone cottage surrounded by a charming garden (if money were no object), I know there are disadvantages. One is that the Husb would keep bumping his head on the ancient beams. 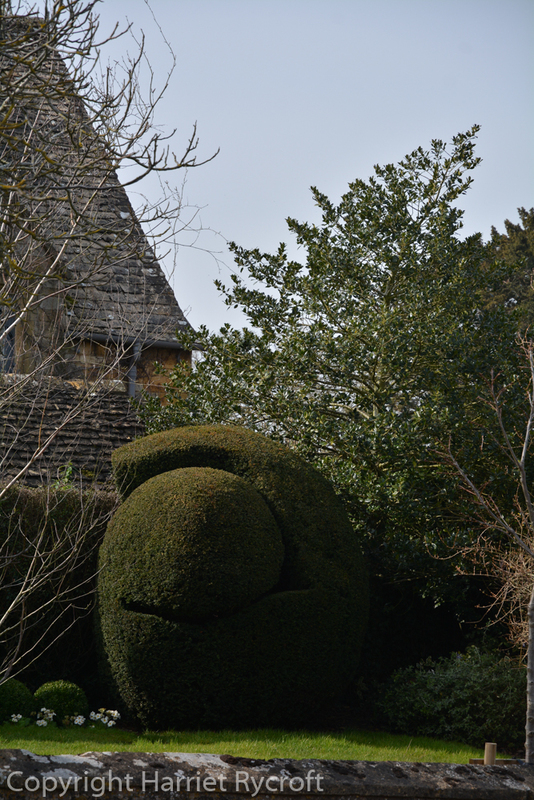 The other is that people would be gawping through the garden gate, peering at my pots and tutting about my topiary. So for now I am one of those gawpers. 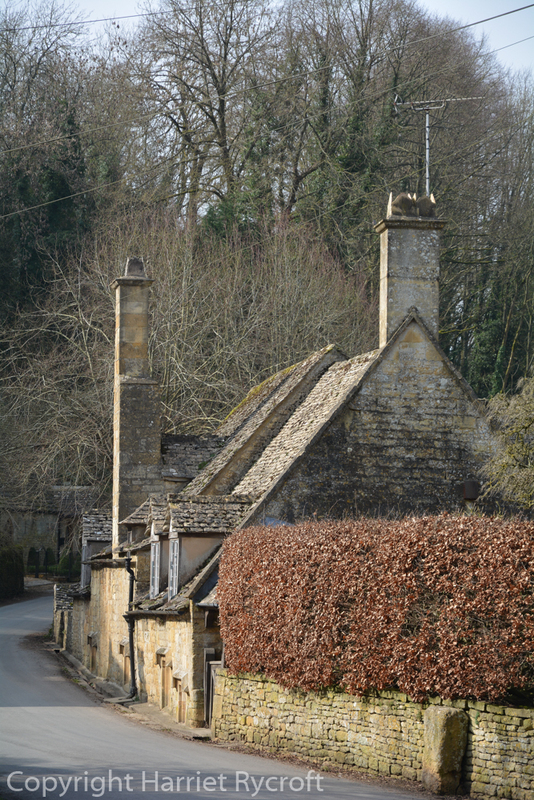 I was raised in a somewhat shaggier part of the country, so I’m still fascinated by the decorative detail of a Cotswold village and when we have visitors staying we have the excuse to do some touristy stuff. 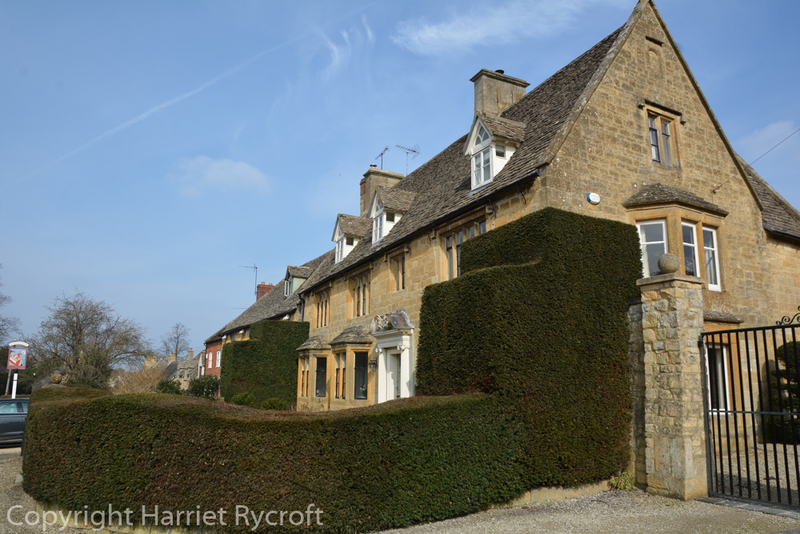 Last weekend my sister and I drove up to Snowshill (or Snozzle). 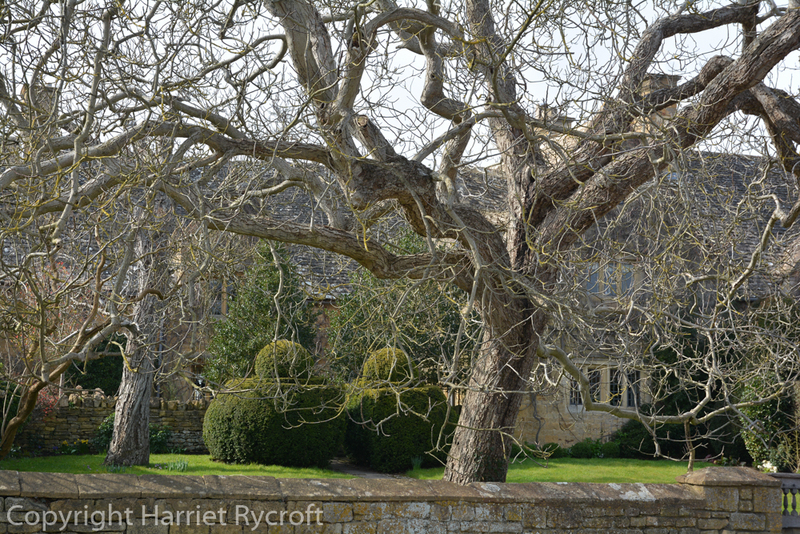 It’s famous for the National Trust property in the village, Snowshill Manor – we had intended to visit the house but of course hadn’t checked the website properly and it wasn’t open for the spring season yet. Nevertheless, we had a lovely time wandering round the village, fantasising about living somewhere like this. Mind you, the village is plastered to the side of a steep valley and it can’t be too funny trying to get to work from here on a snowy day. There is a clue in the name. The Snowshill Lavender farm is on the tops of the hills above the village and we screeched to a halt to take pictures of the fuzzy banks of clipped lavender – lovely warm texture on a crisp, cool day. They must have some serious machinery. The Manor is behind the big tree and lodge on the left. Lots of the old houses have beautiful dry stone walls around their gardens, some are smart and clever like the one above, but I prefer the older, wobblier, moss-encrusted type. I like them dripping with Aubrieta or Centranthus ruber too, a pleasure that comes a little later in the year (although some Aubrieta is already beginning to show colour) – I’ll give you some examples another time. You’ve got to admire the optimism of nettles! Embedded house – Look how hard that beech hedge is working, it really brightens the scene. 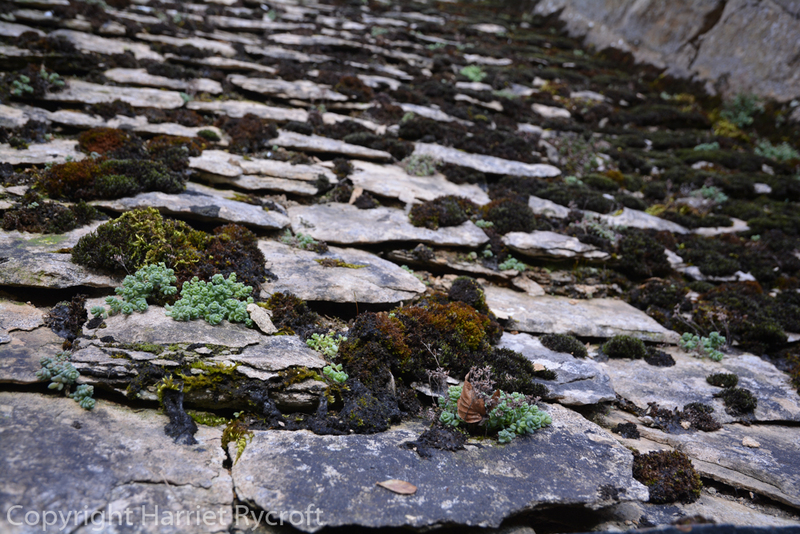 One particular house was embedded in the side of the hill below the road, with some windows at pavement level, so that the beautiful moss and sedum colonies on the split-stone roof were conveniently at eye level. I hate to think how expensive it must be to renovate a roof like this, it’s really specialised work. Thank goodness people aren’t allowed to rip them out though, because an old stone roof is a thing of rare, wonky beauty. As usual I was focusing on plants. I often take snaps of front doors and gates because I appreciate a bit of welcoming container planting – around here it is usually twin box topiary or standard bay trees, but sometimes this is done with a twist or a bit of originality. 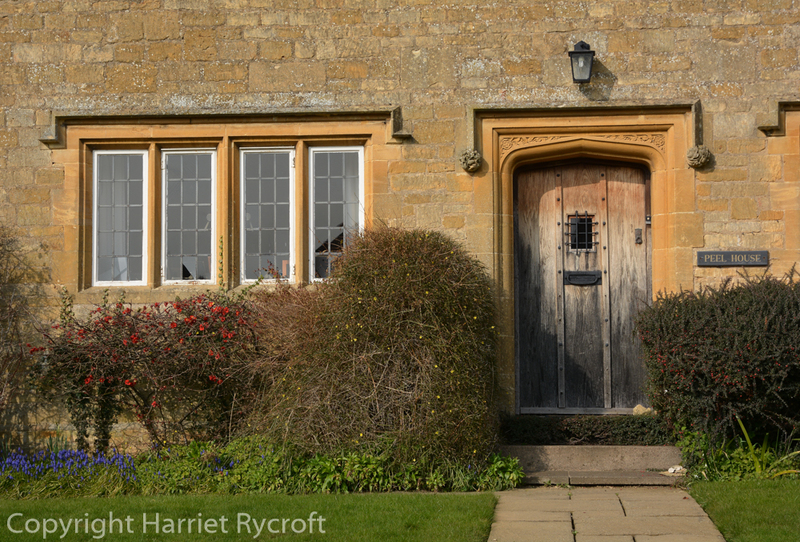 I reckon front gardens, doors and gateways are fair game for photography – I do worry about people thinking I’m casing the joint for a bit of burglary though. I hope most of them realise I’m just another nosy plant nut. I enjoy the care that people take with planting on the fronts of their houses – it seems a generous kind of gardening to me. 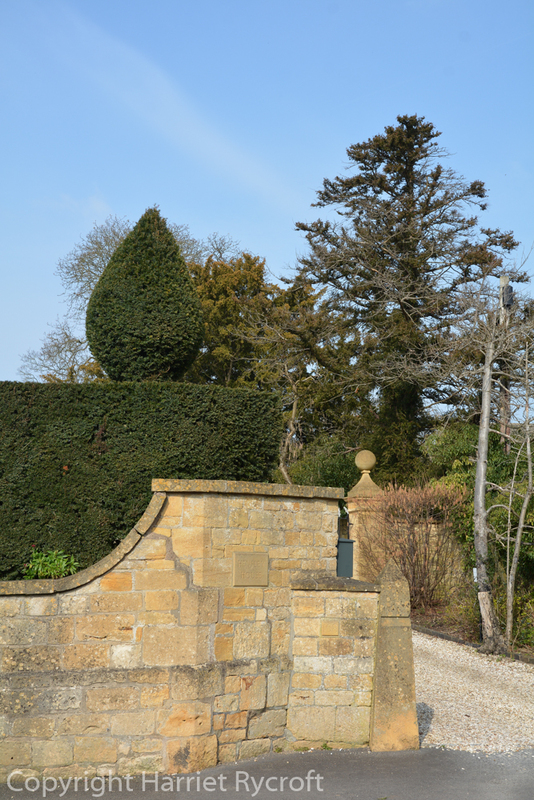 Again, topiary often features, and neat green blobs or even rectangles really come into their own at this time of year, when the light is clear, shadows are sharp, and flowers are not stealing the limelight. A round of applause please for this exceptionally neat rectangle of Pyracantha! I enjoyed the way the Cotoneaster on the right has been clipped to form a topiary doorstep. Just as quaint as a cottage garden should be. We headed on down to the next village, Broadway, which is bigger and more touristy; being on flat ground and near a main road it is prone to charabancs, but it has many beautiful houses and as soon as you walk away from the main shopping area it is much quieter, even on a sunny spring day. I’m sure by the end of the summer the householders are totally sick of people prying into their front gardens but the atmosphere when we went was friendly and we had a lively chat with a lady who was tidying her (already very smart) front garden about her fancy motorised wheelbarrow. 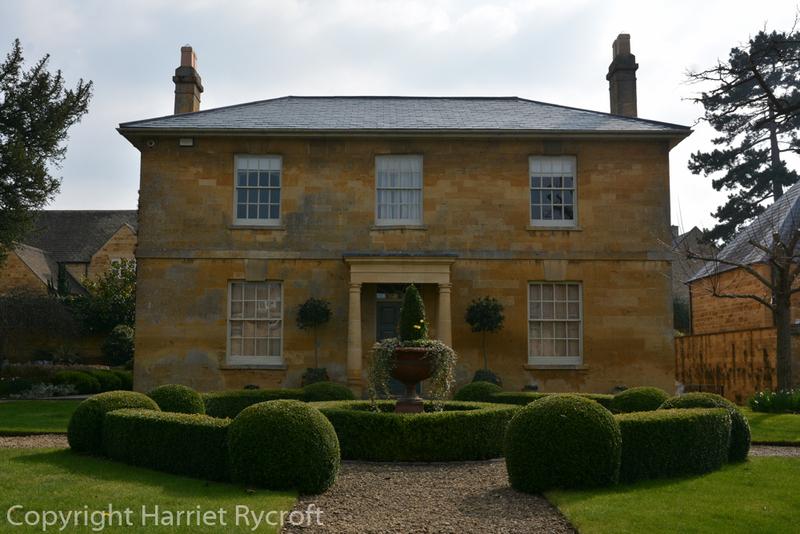 Some of the front gardens are definitely “look at me” spaces, others are more intriguing – to me, anyway. I must say some of them are very tantalising and make me want to see what exciting planting is hidden away too. But I draw the line at actually walking in uninvited. 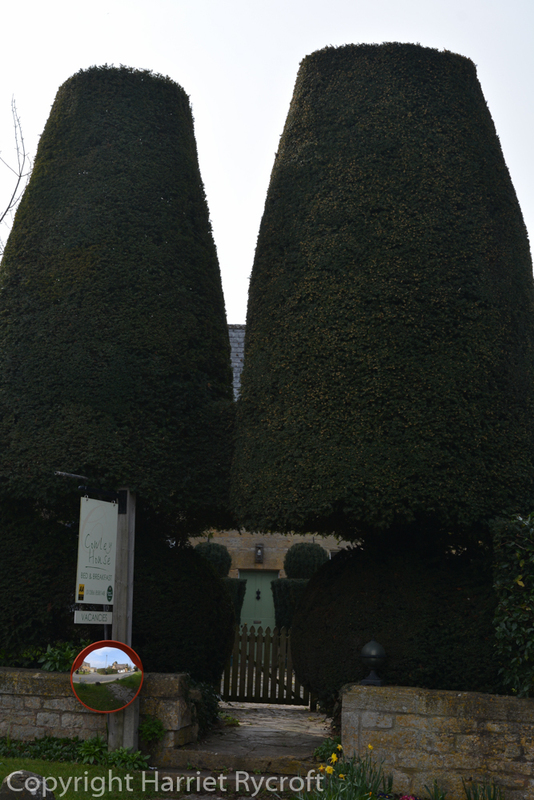 As we walked about we noted the preponderance of very, VERY tidy topiary. Not just of the “Being considerably richer than you we have bought twenty box balls and a forest of spirals and had a little man put them in for us” kind but also of the long-established sort, which moulds itself to walls and houses, morphing into unique shapes over decades. You are not the only ones to be caught out by the opening times. Mum and I often turn up and the NT property is closed. Complicated opening hours! I really must get my pyracantha in order. I fact my whole garden feels scruffy in comparison to these ones! Yes, I was guilty of not interpreting the table on the website correctly… My entire garden is very messy at the moment. It’ll never be as pristine as most of these, that’s just not my style (that’s my excuse and I’m sticking to it) – and my Pyracantha is completely out of control – never mind! I’m jealous of that pyracantha! I was training one here to do the same (though not with as much precision, yet!). Then someone named Imogen snapped the top off! I’m left with a 4 foot “stump” and a hope of regrowth from the bottom which won’t produce the same effect in what time is left to me. Maybe I’ll fan-train it instead. Oh well …. Hi John – the ways a gardener can be thwarted are endless!I did think about hacking our pyracantha down completely until I saw the fieldfares on it one winter. Snowshill & Broadway are beautiful, but I wouldn’t want to live there either. I guess you would have to accept that people would be photographing your house, but it must not be easy. That Cotoneaster door step is impressive, though I guess you wouldn’t really step on it? Beautiful pics Harriet. Aw thanks Odette. 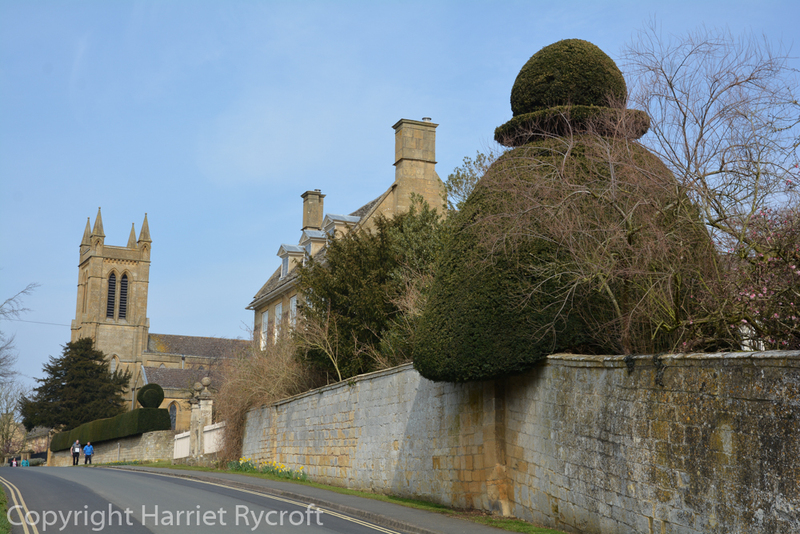 Yes I think topiary is inherently humorous – the more bonkers the better!